Government "of the People" cannot flourish beneath a suffocating cloak of secrecy. And secrecy is often aimed, not at protecting us from enemies abroad, but at deceiving us about the dark machinations of our own government. The most consequential secrets are those used to conceal steps taken to establish predicates for future wars -- unwarranted conflicts that seem to roll off an endless assembly line. No-fly zones, bombings, sanctions, false flags, blockades, mercenaries, bloodthirsty terrorists have all become stock in trade. Sanctions destabilize our targets through hunger and suffering. We terrorize and blow body parts into the streets like calling cards. Regime change is the end game; coups and assassinations are fair play. Before Assange, those who "broke the code" and detected the Deep State's patterns of misbehavior were labeled "conspiracy theorists" or worse. But with the advent of WikiLeaks, original, unchallenged source documents have proven our arguments, and revealed the truth to citizens. Donald Trump's election sent violent shock waves through the Deep State. People had been warned they could not elect this person -- but they had ignored the instructions. That was not supposed to happen -- and could not be permitted to happen again. The People demonstrated that the mainstream media had lost its tight grip on the national conversation. National intelligence was being revealed and shared. Generations of subtle censorship had folded under an onslaught of uncensored communications among families, friends, and interest groups. Social media, a new and frightening paradigm, challenged the elite's grip on the levers of power. After Trump, restoring barriers to free speech and communications became a global imperative. Julian Assange and WikiLeaks are among the censors' prized targets. They have disrupted Big Media censorship. Assassinating Assange is not out of the question. He is that important. 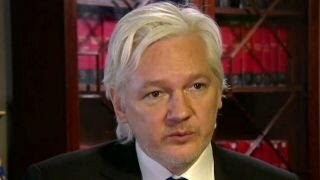 I realize that Julian Assange is controversial, but I'd be pleased if some courageous nation granted him permanent asylum. Let him continue giving citizens an honest peek at the inner workings of their governments. That seems to be our best hope for peace. *Republican Senator Richard H. Black represents the 13th district of Virginia, encompassing parts of both Loudoun and Prince Williams Counties in northern Virginia.